We are often hesitant when it comes to adding dark colors to our kitchen. Too much dark color can make a space look much smaller and unwelcoming that it actually is. However, if a touch of dark color in a kitchen design is done right, then it can make a kitchen look absolutely striking. Darker colors require commitment. Contrary to pale colors, which can be re-painted and dressed up with accessories, one has to be smart with how darker shades can complement and add to the kitchen design. In all the dark-colored kitchens we’ve seen, the most prominent design styles in one of two combinations: dark floor cabinets and lighter wall cabinets, and dark cabinets with light colored countertops, flooring, and walls. Although these two ways greatly compliment and balance the entire kitchen design, there are a few creative ways to incorporate the dark colors within your kitchen. Flip the Colors: If darkening the kitchen cabinets is considered too much, step away from the cabinets and move towards the walls. Update your kitchen by painting one wall a darker shade. The dark wall can easily be complimented by pastel-colored cabinets and light-colored accessories. The color breaks the up the pale color scheme, adding that extra sophistication. Choose Warmer Darks: If there is a concern that darker colors may feel too cold and unflattering to a kitchen design, consider the warmer darks. Instead of the typical black, grey, or navy, try adding purple to a kitchen design. Contrary to the other dark colors, purple has hints of red and pink in its overall hue, making it a warmer darker shade, rather than a cooler one. Purple color adds a regal-ness to the kitchen, and is still a part of the dark color family. Metallic Sophistication: Any dark color can easily be glamorized by metallic. 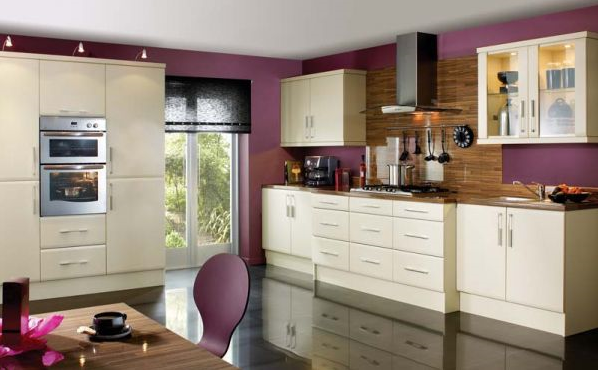 As mentioned above, purple is a great addition as a dark color to a kitchen. Copper accents look beautiful with a dark shade of purple. If a kitchen has a lot of charcoal color in the cabinetry of even the walls, a kitchen can look exceptionally glamorous with warm metals-usually in the golds and bronzes. Island Focal Point: As mentioned in many previous blogs, a kitchen island can easily be a focal point in any kitchen. Consider darkening the island cabinetry against the lighter colored surroundings. If black is too dark, a softer dark such as grey, blue, or purple, can do the trick. If even that is too much, the color can easily be softened by a some traditional touches. Overall, dark colors can be viewed as an intimidating choice for a kitchen. However, it is a great option for a striking, unique design. It adds an element of sophistication to the entire kitchen. Consider your options for dark colors in your kitchen!